absolute stunner. my favorite color scheme of these Royal Ps. Reminds me that i need to get to work on cleaning mine up soon. as for your sentiments - completely agree. We've evolved but convenience a lot of times is wasteful. Rare are the things that we keep for our lifetimes and even pass on to the next generation. I believe that we typewriter collectors will help to usher these machines onward but the rising tide almost leaves no room for what most deem obsolete. 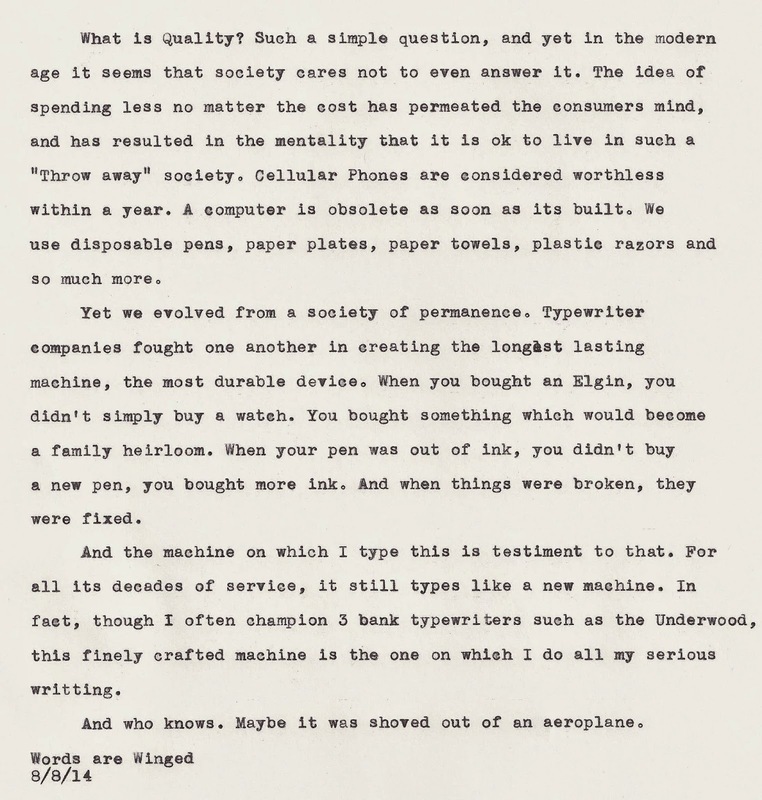 Of course, typewriters will remain in some form, but more and more like a vestige of yesteryear rather than an every day item or even a special instrument that few possess...despite still working just fine. I suppose eventually in maybe another century or so the only time people will see a typewriter is in a museum. Royal Model P's seem to have the best colour schemes, in my opinion. And though typewriter may very well end up forgotten relics, gaining dust in some unvisited museum, so too they may end up prominent once more. It appears that, due to the ability for people to so easily hack key files, Germany and Russia are ordering mechanical typewriters as counter espionage. They've finally decided its much harder to steal a piece of paper than a word file. Great colour scheme. I have one with the same identical scheme myself. Except mine has a vogue typeface. BTW... I feel that quality goes further than just disposable items. It goes through to the way we work and the attitudes we keep. You, sir, are one lucky machine owner. Vogue is incredibly Art Deco, and my favorite art style just happens to be the same. Alas that mine did not just happen to be Vogue as well. How rare would you say that typeface is? Hmm, but then affordability is also a quality. A quality that we may have been valuing higher than durability. But the fleetingness of most 'products' that are made and sold today is remarkable. The cost I think is remarkable; 'stuff' costs so very little. Looking in 'dollar-stores' or the like I'm amazed at the amount of materials and resources that have been used to produce such short-lived 'products'.